Just as New Yorkers have the Hamptons, Mumbaikars have Alibaug – a broad comparison it’s true but essentially viable. Escaping the mad rush of the city to an idyllic country setting seems to be a universally celebrated idea, but part of achieving that holiday nirvana is having an equally astonishing home to spend it in. 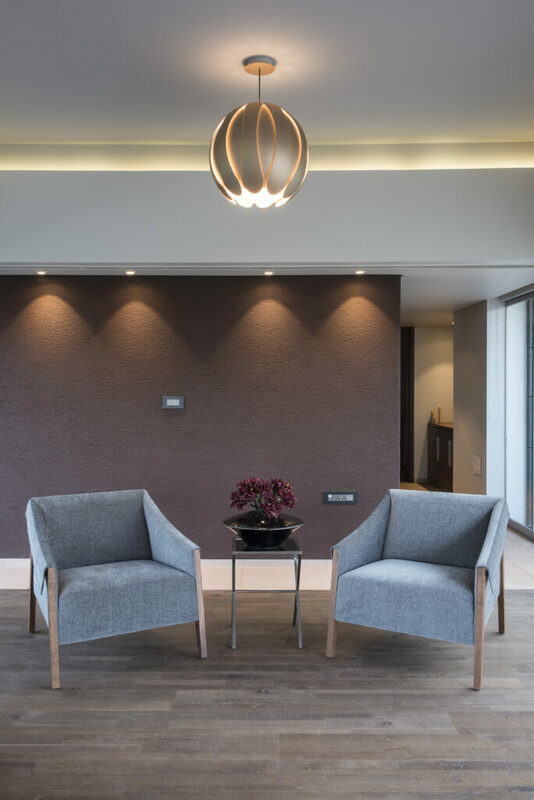 Within the rolling hills of Katalpada village, lies the Aurelia House designed by SHROFFleon architects that truly envisage the many amazing possibilities of a holiday home. When they began work on the project there was already an existing structure to work with, but according to lead architect Kayzad Shroff, there was so much more untapped potential. 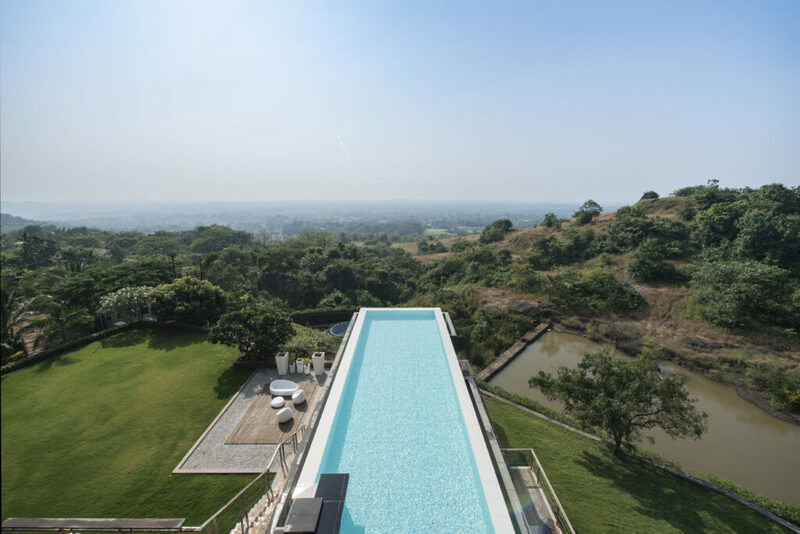 ‘There was already a pool but it didn’t make use of the beautiful nature in the vicinity so we decided to work with the surrounding terrain in our redesign.’ He says. 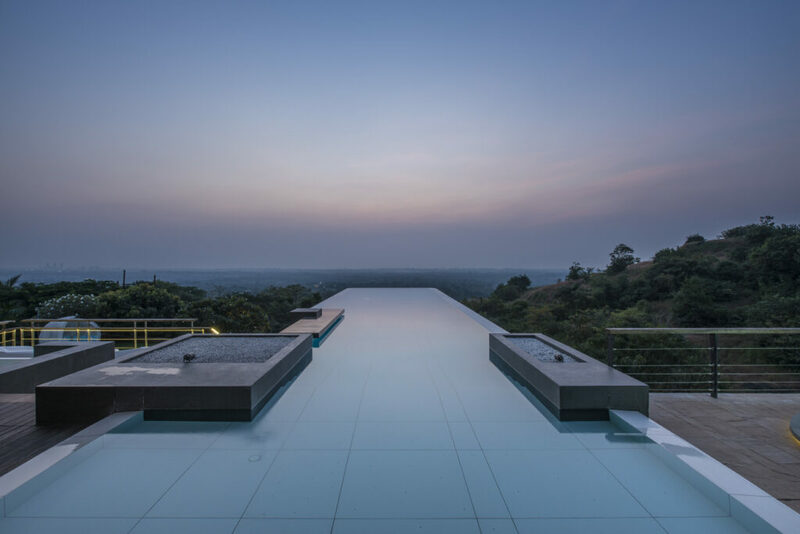 They relocated the infinity pool to the rooftop where thanks to the natural incline, the water spills over to a secondary water body – a cascading waterfall – that became the backdrop for the living room below. 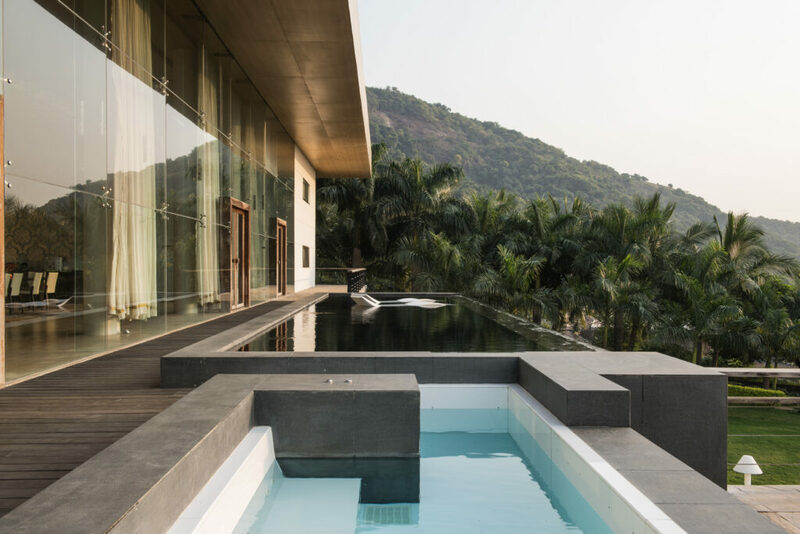 Perpendicular to the infinity pool is an 8-inch deep water body in locally sourced black stone that allows for unrestricted views and overspills over a textured rubble wall into a larger water body below. All the water bodies have been fitted with fibre optic lights to provide a subtle ambience post-sundown. The bedrooms overlook opposite sides of the house. 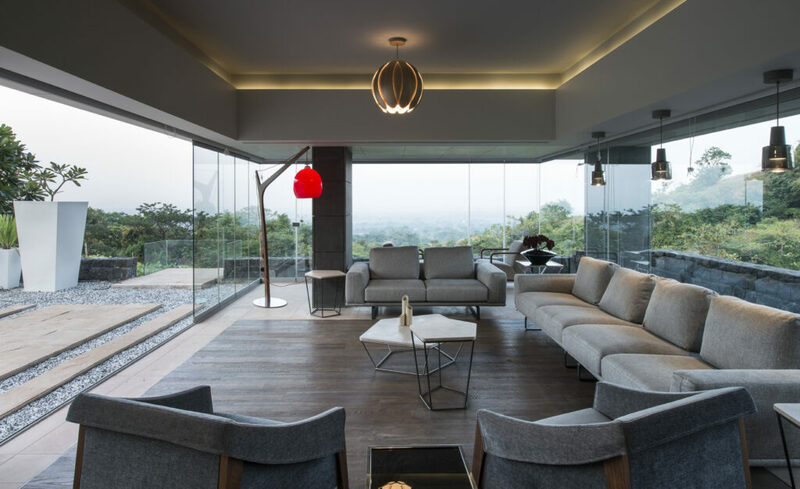 One opens onto the forest, outdoor patio and the rolling hills beyond while the master suite opens on both ends to a forest view as well as a view of the rubble waterfall. The interiors are airy with high ceilings and a mainly open plan layout, but they wanted to instil a sense of cosiness within this expansive space. Kayzad tells us that the aim was to create ‘intimate spaces within the large house’ all of which correlate to the theme of nature. With the use of stone, water features and neutral colour palette, they’ve managed to cut the severity of the modern design and ensure that it still feels like a home. 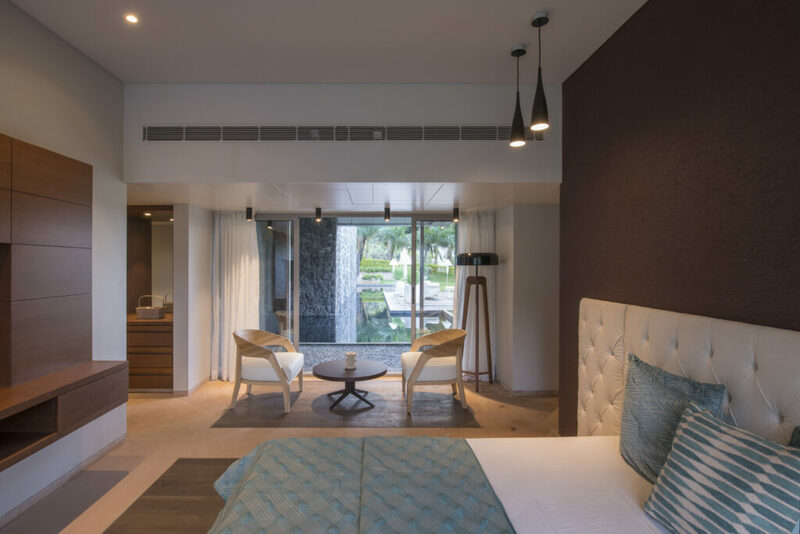 The most alluring aspect of Aurelia House is its consistent celebration of natural elements, “People from Bombay always want a lot of nature, because they don’t get it in the city.” says Kayzad. 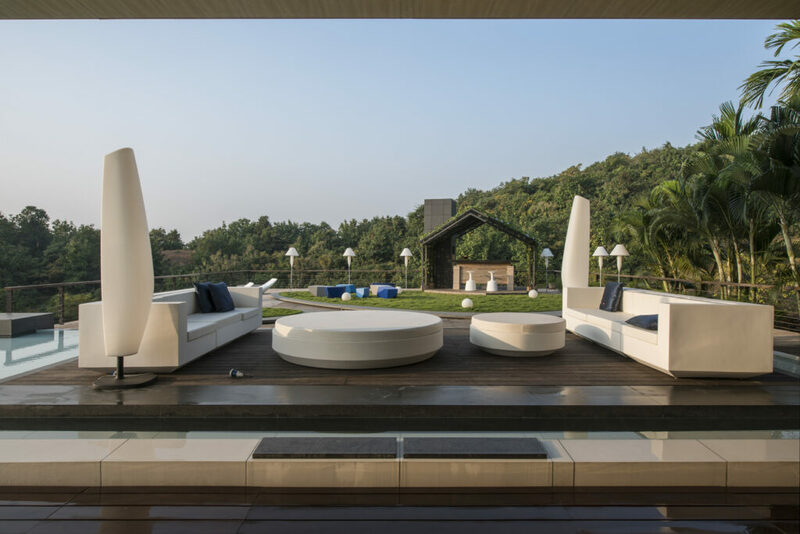 Of course, in the perfection of the Alibaug hills, the blank canvas of natural splendour was already there to work with, but with a little help, it has been transformed into a truly unforgettable experience. Previous article10 hottest coffee table books for 2018!